This scary huge long Red tongue embedded in the black apparel just remembers as the Hollywood movies “The Lizard Boy” or “Dracula” or even an ancient Chinese Dragon, but it actually resembles Gene Simmons, the bassist of the most famous legendary rock bands of America KISS. Every one who loves rock music especially the American people can’t forget KISS for their songs and Gene Simmons who’s constantly flaunting his incredibly long tongue in every concert. 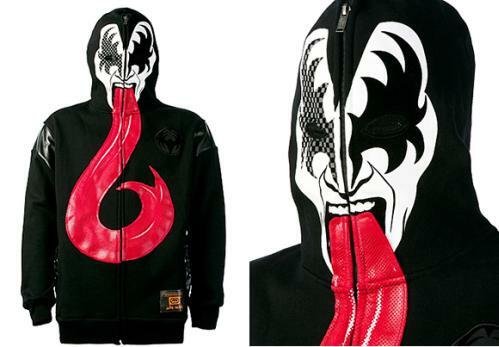 One of his fans has made a Gene Simmon costume, a Black Rhino Kiss Hoodie which resembles Gene Simmon’s demon character and his long tongue. With Zips top to bottom, it has a split kangaroo pockets (but that doesn’t mean that even you can carry your kids like kangaroo’s), rib knit sleeve cuffs and hem which is absolutely killer. It also has PVC inserts and elbow patches . This coolest and scary apparel is the perfect for a “Go as you like” party or any “Musk Party” or in any fun party.